To be able to contribute to equity in health care by helping patients and the marginalised sections regain trust in public health service with easy access to facilities, courtesy charity fundraising or online charity. Fuelled by a dream to be the change-maker to solve public health problems, we see ourselves vigorously striving towards a new health policy that makes public health easily accessible to all with contribution from other like-minded healthcare NGOs in India. Public health service in India is yet to reach its potential for want of a robust health policy as expenditure by both central and state governments on health as a percentage of Gross Domestic Product (GDP) still remains abysmally low. Reports suggest public health care spending as a percentage of GDP stood at 1.4 percent in India during 2016-17 as against Kuwait (2.15%), Malaysia (2.21%), Oman (2.17%) and China (3.02%) and Thailand (3.58%) respectively. In fact, public health spending was around 1% when Helping Hand Foundation was launched in 2007 by a team of Hyderabad-based IT professionals with the sole aim of helping patients through various charity fundraising activities like pooling zakat fund or online charity. 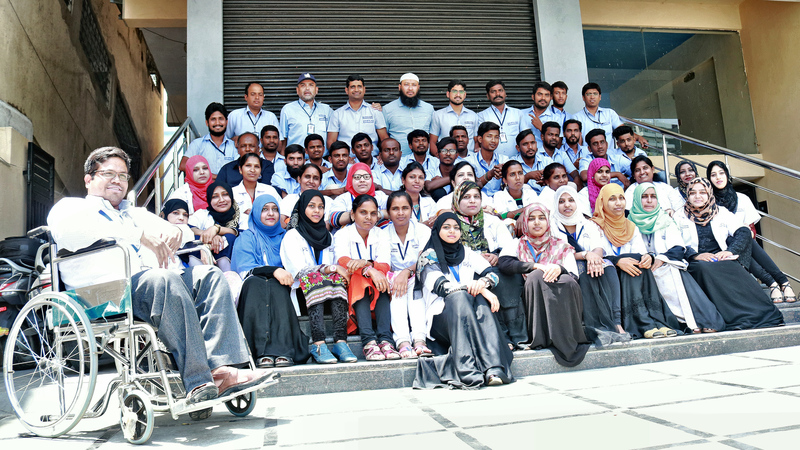 Led by Mujtaba Hasan Askari – who made helping needy people in health care his full-time vocation after having worked in a top-notch IT company for over two decades – the Helping Hand Foundation has emerged as one of the best charities to donate to in India. We are an equal opportunity NGO in health sector with cancer, TB survivors, PLHIV, polio-afflicted, paraplegics, blind, widows, orphans and physically challenged volunteers comprising the bulk of our workforce to help the poor. What sets us apart from other online charities and crowdfunding sites in India is the direct involvement of our 50 plus dedicated and passionate team of Praja Arogyamitras – a volunteer-based support system in public health care - working across 20 government hospitals. Being one of the largest privately funded NGO in health sector in India, our highly-trained and motivated patient counsellors share empathy with the patients as they themselves have gone through pain and hardships in their lives. By ensuring that those who donate for a cause are not let down, the healthcare NGO volunteers act as a catalyst in improving the public accessibility & confidence in government hospitals. While helping patients through online charity donations India, we make sure that charity funds are spent judiciously by directly engaging with the stakeholders including diagnostic labs, medical suppliers and doctors for the best possible prognosis. Initially, we confined ourselves to providing financial aid for medical emergencies to help the poor besides providing livelihood support to sick patients, widows & orphans but multiple public health issues made us expand our activities. Thanks to those who donate online to charity including socially responsible companies and individuals, India’s leading healthcare NGO Helping Hand Foundation now provides comprehensive public health management in state-run hospitals helping patients regain trust in public health service. The wide-ranging public health care services include palliative care, counselling for child sexual abuse victims, helping patients through guidance, free transport, nutritional support to cancer, Counseling for TB & MDR-TB patients, subsidized implants, diagnostics besides health surveys & public health advocacy. We feel proud to inform all those who donate to charity in India supporting health organisations & healthcare NGOs like Helping Hand Foundation that we managed to connect with 27.75 lakh patients during 2017-18.